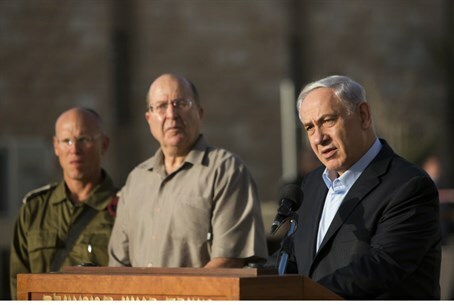 'This operation will end only when quiet and security are restored to the citizens of Israel for a lengthy period'. “I would like to express special appreciation for the Defense Minister, the Chief-of-Staff, GOC Southern Command, our heroic soldiers and commanders, and also the ISA which has been assisting them. There has been very strong teamwork here, the goal of which is to bring security to the citizens of Israel and the State of Israel. “I express deep appreciation to all of our soldiers for their fighting spirit under difficult conditions, in urban areas with tunnels. There are many stories of heroism here. I am impressed by the effort and by the operations in the field. “I would like to congratulate the commanders and soldiers on what they have achieved. I visited with wounded soldiers in Be'er Sheva today. I wish them a quick recovery; they have tremendous spirit. Along with the Defense Minister, the Chief-of-Staff and all of Israel, I would like to again send my condolences to the families of the fallen."